McFarlane Toys to reveal the highly collectible and much anticipated new Game of Thrones construction sets at 2015 San Diego Comic-Con. 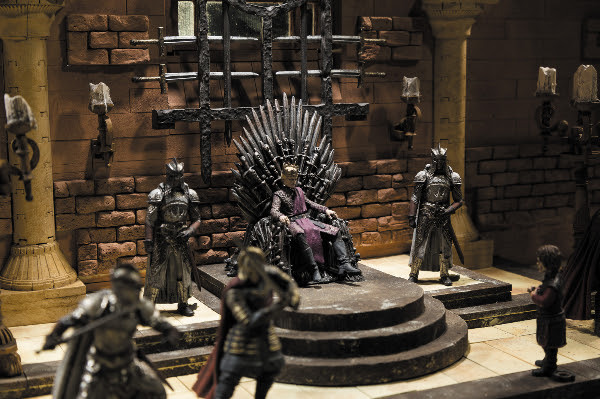 McFarlane Toys, in partnership with HBO Global Licensing, announced today a new licensing agreement to bring the global television phenomenon Game of Thrones to the construction toy aisles this Fall 2015. “We're thrilled to have the opportunity to create high-quality collectible construction sets based on this fan-favorite property. Both collectors and fans of this epic series can build their favorite scenes with this new product line,” McFarlane added. Each Game of Thrones construction set will feature iconic environments with realistic sculpted pieces, along with multiple figures of fan-favorite characters. McFarlane Toys will be unveiling the first look of this new product line, including the legendary Game of Thrones Iron Throne Room and Mother of Dragons construction sets, at International San Diego Comic-Con from July 8-12 at booth #2729. Construction Figure Packs: MSRP $9.99 - Starter packs featuring Houses Stark and Lannister with your favorite house armies, complete with house banner and sigil.